Marrakesh or Marrakech is a major city in the northwest African nation of Morocco. It is the forth largest city in the country but it is an important one for it is the capital of the mid-southwestern region of Marrakesh-Asfi. Marrakesh is commonly considered as the most important of Morocco's four former imperial cities Fes, Marrakesh, Meknes and Rabat. 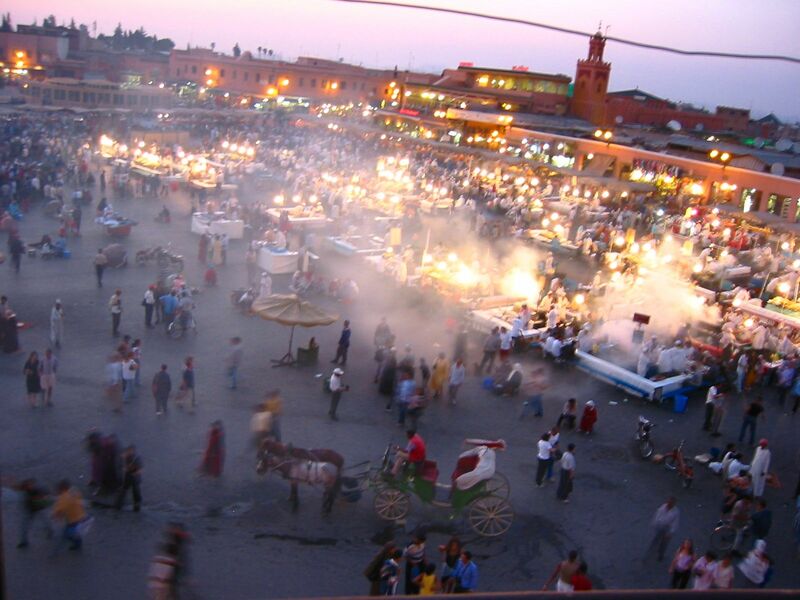 Marrakech has established itself as a cultural, religious, and trading centre for the Maghreb and sub-Saharan Africa; It is the host of the is the busiest square, Jemma el-Fnaa in Africa. The city has earned the nickname of “Red City” or “Ochre City” due to the city wall and lots of buildings constructed in red sandstone during the period 1122-1123 by Ali ibn Yusf. Like many Moroccan cities, Marrakesh is a place where vendors and their stalls (the medina) from the region packed in concentration to do business. Today it is one of the busiest cities, as both economic centres and tourist destinations, in Africa. Tourism is strongly advocated and supported by the the reigning Moroccan monarch, Mohammed VI, with the goal of doubling the number of tourists visiting Morocco to 20 million by 2020. 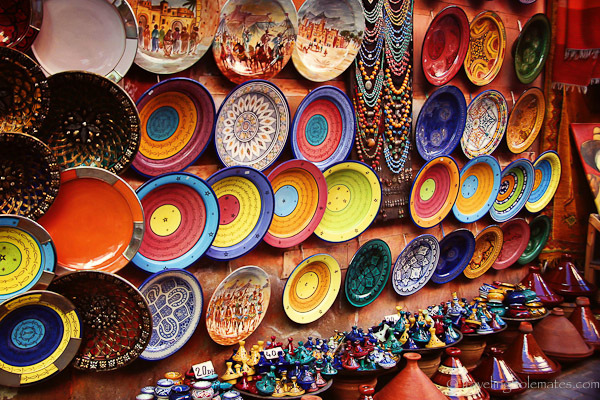 Marrakesh has the largest traditional Berber market (souk) in Morocco, with some 18 souks selling wares ranging from traditional Berber carpets to modern consumer electronics. Before we move on to the landmarks, let's begin our research with a bit of the Marrakesh history. The city is inhabited by Berber farmers as in the region. However the city was founded in 1062 by Abu Bakr ibn Umar, chieftain and cousin of Almoravid king Yusuf ibn Tashfin. 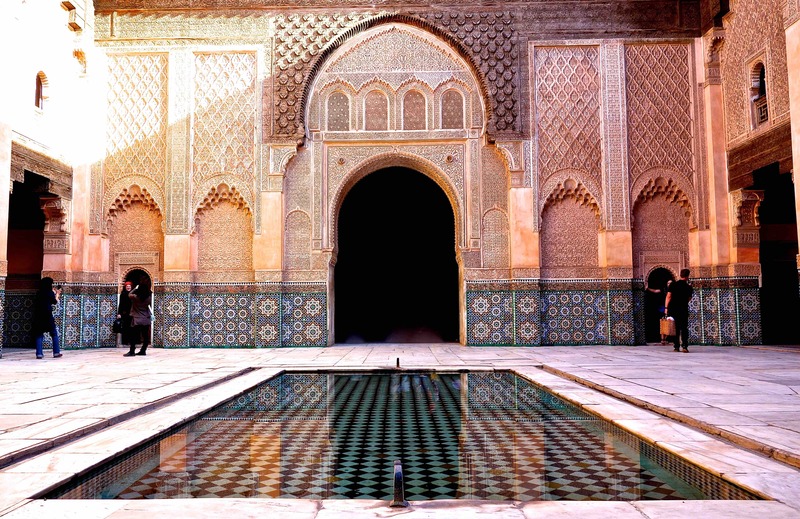 In the 12th century, the Almoravids built many madrasas (Koranic schools) and mosques in Marrakesh that bear much influences from the region of Andalusian (a south-western European region established as an autonomous community of the Kingdom of Spain). The city was also influenced by French culture before it’s independence in 1956. In 1912 the French Protectorate in Morocco was established and T'hami El Glaoui, who has a strong connection with French community in Marrakech, became Pasha of Marrakesh and held this position nearly throughout the duration of the protectorate. In 2009, Marrakech mayor Fatima Zahra Mansouri became the second woman to be elected mayor in Morocco. 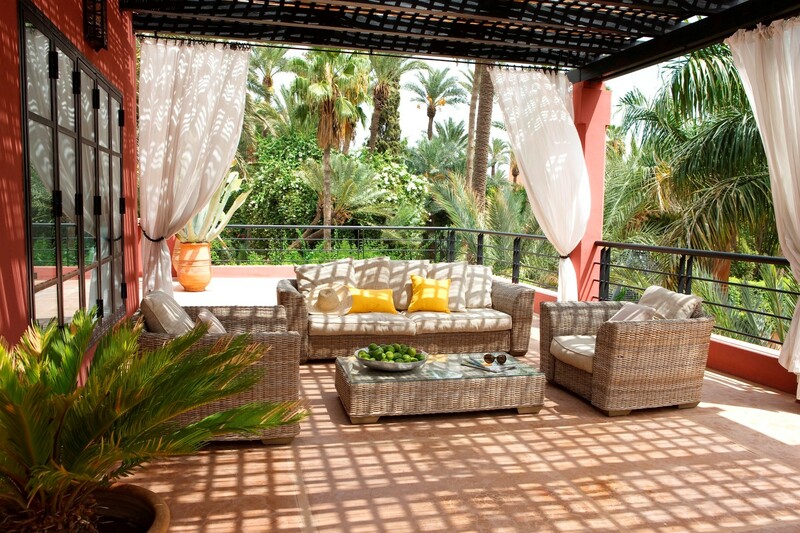 As a result Marrakech is particularly popular with the French due to historical reason. Ménara International Airport and the Marrakesh railway station are major transportation for tourist. We can take the railway to get to the famous city Casablanca and northern Morocco. Marrakesh has several universities and schools, a number of Moroccan football clubs has has hosted the World Touring Car Championship, Auto GP and FIA Formula Two Championship races. The main road network within and around Marrakesh is well paved. The major highway A7 connecting Marrakesh with Casablanca to the south is a 210 km toll expressway. A modern highway system inaugurated in April 2007 connect Marrakesh with Tangiers and Agadir. the city walls of Marrakesh are made of a distinct orange-red clay and chalk, giving the city its nickname as the "red city". The ramparts of city stretch 19 kilometres or 12 miles strong surround the city and offer protection from fortifications since it was built by the Almoravids in the 12th century. They stands up to 19 feet (5.8 m) high and have 20 gates and 200 towers along them. There are many gates that are great for tourist sightseeing. Bab Agnaou, one of the most visited gates, was built in the 12th century during the Almohad dynasty. The Berber name Agnaou refers to people of Sub-Saharan African origin (cf. Akal-n-iguinawen - land of the black). The corner-pieces are embellished with floral decorations. This ornamentation is framed by three panels marked with an inscription from the Quran in Maghrebi script using foliated Kufic letters. Bab Aghmat is located east of the Jewish and Muslim cemeteries, and is near the tomb of Ali ibn Yusuf. Bab Berrima with its solid towers stands near the Badi Palace. Bab er Robb (meaning "Lord's gate") is a southern exit of the city. It is not far away from Bab Agnaou. Built in the 12th century, it is the exit to the mountain towns of Amizmiz and Asni. Bab el Khémis, situated in the northeastern corner, is one of the city's main gates and features a man-made spring. 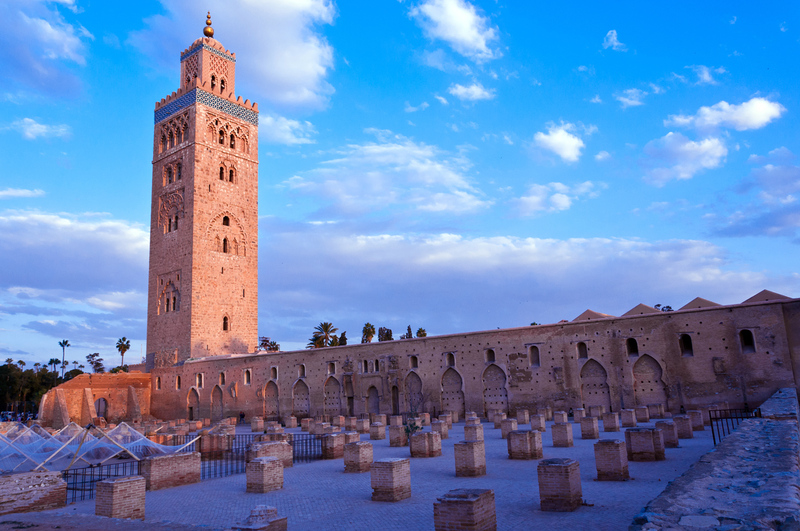 There are three Mosques in the city, Koutoubia Mosque, Ben Youssef Mosque and Mouassine Mosque. Koutoubia Mosque is the largest mosque in the city, located in the southwest medina quarter of Marrakesh alongside the square. It was completed under the reign of the Almohad Caliph Yaqub al-Mansur (1184-1199). The mosque is made of red stone and brick and measures 80 metres (260 ft) long and 60 metres (200 ft) wide. The Umayyad-style minaret is constructed from sandstone and stands 77 metres (253 ft) high. The spire atop the minaret is decorated with gilded copper balls that decrease in size towards the top, a style unique to Morocco. Souk Semmarine, which sells everything from brightly coloured bejewelled sandals and slippers and leather pouffes to jewellery and kaftans. 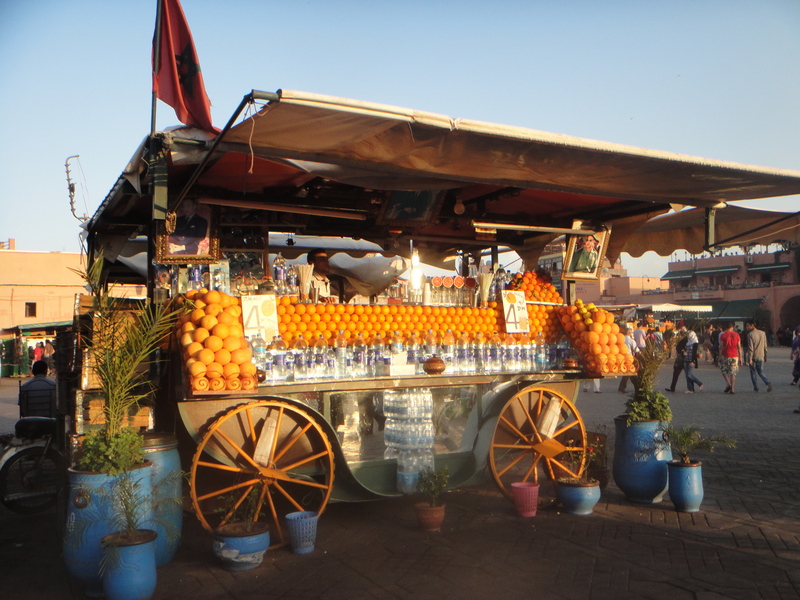 Souk Ableuh contains stalls which specialize in lemons, chilis, capers, pickles, green, red, and black olives, and mint, a common ingredient of Moroccan cuisine and tea. Souk Kchacha specializes in dried fruit and nuts, including dates, figs, walnuts, cashews and apricots. 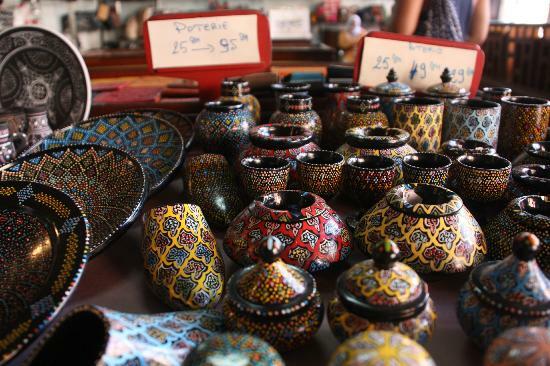 Rahba Qedima contains stalls selling hand-woven baskets, natural perfumes, knitted hats, scarves, tee shirts, Ramadan tea, ginseng, and alligator and iguana skins. Criee Berbiere, to the northeast of this market, is noted for its dark Berber carpets and rugs. Souk Belaarif sells modern consumer goods. Souk Haddadine specializes in ironware and lanterns. There are a few gardens in Marrakesh each bearing different and interesting origins. The more famous onces are the Menara gardens and the Majorelle Garden. The Menara gardens are located to the west of the city, at the gates of the Atlas mountains. They were built around 1130 for the by the Almohad ruler Abd al-Mu'min. There is a beautiful pavilion inside the garden was built during the 16th century Saadi dynasty and renovated in 1869 by sultan Abderrahmane of Morocco, who used to stay here in summertime. The artificial lake beside the pavilion is surrounded by orchards and olive groves. There is also a small amphitheater and a symmetrical pool. 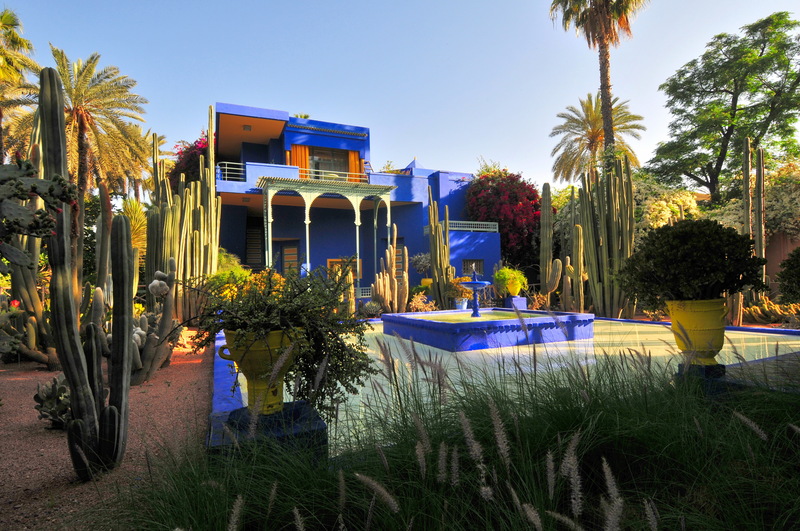 The Majorelle Garden was at one time the home of the landscape painter Jacques Majorelle and was subsequently bought and restored by famed designer Yves Saint Laurent. The garden features a stele erected in Yves Saint Laurent’s memory and the Museum of Islamic Art. The Museum of Islamic Art is painted in the famous Majorelle Blue, which is combination of lemon yellow and striking cobalt blue, a sharp blue color, offers a very colorful retreat for the locals as well as for the tourist. With a size of 400 hectares, the Agdal Gardens feature citrus, apricot, pomegranate, olive and cypress trees. The Dar al Baida pavilion inside the garden was home for Sultan Moulay Hassan, which is what gave a meaningful history to the garden. The garden is also known for its historic swimming pool, where a Sultan is said to have drowned. For those who are really interested in learning the history of the place, tombs are great places to visit. The Saadian Tombs were built in the 16th century as a mausoleum to bury numerous Saadian rulers and entertainers. It was lost for many years until the French rediscovered it in 1917 using aerial photographs. The mausoleum comprises the corpses of about sixty members of the Saadi Dynasty. The room was designed with typical Islamic architectural style at the time with floral motifs, calligraphy, zellij and carrara marble, and the stele from cedar wood and stucco. The Medina holds the tombs of the seven patron saints of Morocco, which are visited every year by pilgrims during the week-long ziara pilgrimage. According to tradition, it is believed that these saints are only sleeping and will awaken one day to resume their good deeds. A pilgrimage to the tombs offers an alternative to the hajj to Mecca and Medina for people of western Morocco who could not visit Arabia due to the arduous and costly journey involved. Circumambulation of the tombs is undertaken by devotees to achieve inner purity. The old Jewish Quarter (Mellah) was created in 1558 by the Saadians at the site of the original stables of the sultan. At the time, the Jewish community consisted of a large portion of the city's bankers, jewelers, metalworkers, tailors and sugar traders. The Jewish cemetery here is the largest of its kind in Morocco. Characterized by white-washed tombs and sandy graves, the cemetery is located within the Medina on land adjacent to the Mellah. If you don't mind a bit of a strong smell, you can visit the world famous local tanneries or join a tannery tour. Once you get to the tannery district you can probably feel the most medieval experience you can get out of the city. The tanners have been there since the city was found. I guess back then this is one of the key commercial activities. The product from the tannery are sold in all the souks and in the city gate. Given the strong smell, you may want to allocate a short period of time and move on to other spots quickly. The Jemaa el-Fnaa, part of a UNESCO World Heritage site since 1985, is one of the best-known squares in Africa and is the centre of city activity and trade. It has been described as a "world-famous square", "a metaphorical urban icon where (spectacularized) Moroccan tradition encounters modernity." While historically this square was used for public decapitations by rulers who sought to maintain their power by frightening the public, the square attracted dwellers from the surrounding desert and mountains to trade here, and stalls were raised in the square from early in its history. The square attracted tradesmen, snake charmers , dancing boys of the Chleuh Atlas tribe, and musicians playing pipes, tambourines and African drums. No wonder the meaning of the name Jemaa el-Fnaa roughly means “the assembly of trespassers or malefactors”. Today the square attracts people from a diversity of social and ethnic backgrounds and tourists from all around the world. Snake charmers, acrobats, magicians, mystics, musicians, monkey trainers, herb sellers, story-tellers, dentists, pickpockets, and entertainers in medieval garb still populate the square and has rightly maintained its fame as “the bridge between the past and the present”.